Using if/elif/else statements in ArcGIS Field Calculator? 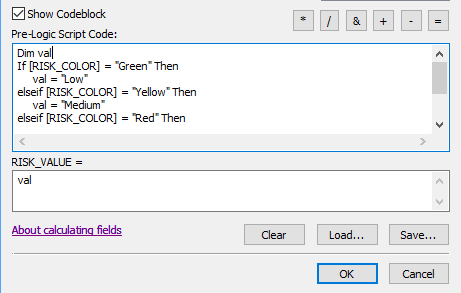 Checking for values in one column and do something in another using ArcGIS Field Calculator? but I just can't get my code to work. I am trying to do a simple if/then statement in field calculator. 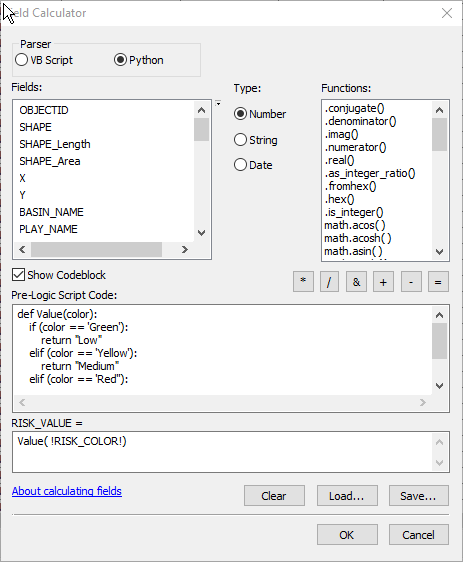 I have a column (risk_value) I want to populate based on the values in the other (risk_color). There are only four values in Risk_color: Green, yellow, red, null. It is how you are dealing with Null values. You are treating Null as a string when it is NOTHING! How can nothing be something? But now think about what you are asking, in your case if colour is not green, yellow or red then it can only be a Null value. So you don't need to test if it is Null as you have already checked all other options. Not the answer you're looking for? Browse other questions tagged arcgis-desktop arcgis-10.3 field-calculator python-parser vba or ask your own question.